While practicing at the Rochester Zen Center during 1979, I found a notice that an authentic Japanese Rinzai Zen master was living in a mountain center near Los Angeles. He was accepting students for the 1970-71 winter training session. Here, I thought, was the real thing! A genuine, Japanese master from the most famous lineage of Zen masters, the line of Lin Chi, Joshu and Matsu ― the biggies of ninth and tenth century China. I quickly sent off a letter, and more quickly received an invitation. I arrived in late October, days before the winter Sessu (training session) was to begin. A student from the center arrived about an hour after my plane. We had a difficult time locating each other as I had not carried a sign with me asking “Mt. Baldy?”. In Cleveland, before getting on the plane, I was politely whisked aside by three airport agents and searched. Apparently, dressed as I was in mountain hiking clothes and carrying a backpack, matched whatever set of characteristics for hijackers they had at the time. All in all, I felt this was not an auspicious beginning. When we arrived at Mt. Baldy that bright October morning — and spent nearly an hour slowly climbing the mountain's steep switchbacks through stunning scenery — I had no idea the great change in my life that was about to occur. My journey into self was about to make an abrupt cultural shift to eighteenth century Japan. On arrival, I found monks and lay students busily working at various jobs, including sewing meditation cushions and robes. There was an administrative section, a maintenance section, a gardening section, and one of the traditionally most important, the kitchen section where there was a cook and his assistant — a position of great honor. A few days later, I was working on clearing the Kinhin area — where we walked in meditation after each sitting session in the Zendo — of rocks and leaves and then cleaning the outdoor toilets. Later I was assigned to weatherproofing building roofs. Sasaki Roshi's mountain center was a transformed Boy Scout camp with 12 buildings, located on one of the three peaks of Mt. San Antonio formerly called Thunder Mountain. The tallest peak is also known as Mt. Baldy. The center is set amidst giant pine trees, some of them towering at least 150 feet high with pine cones almost as big as a person's head. Each evening the fog would come in over the ridge separating Thunder Mountain from Mt. Baldy itself, like an insubstantial garment of night and cold, covering the center in a protective camouflage all through the night and well into the mid-day. The wind accompanying the cold fog would also increase to a steady thirty miles per hour, and much higher in storms. The center's 5,500 foot altitude resulted in some very cold and snow-blown winters. During this severe winter we had perhaps 30 days of snow with a total fall of 90 to 100 inches. Some days the early morning temperature was as low as -9° Fahrenheit, rising to 15 or 20 by mid-day. The three outdoor construction-type toilets were anchored in place by suspended buckets filled with concrete or water. Still, the seventy mile-per-hour storm winds would blow them over during the height of a storm. Our weekly showers were taken in a shack where we had to build a wood fire under twin 55 gallon drums of water that took 10 minutes to heat. Each person was allowed a three minute shower. Residents and monks were housed in three, one-room, bunkroom-style living quarters. Men, women and monks each had a separate building. During sesshin, when the center would fill with Zen students who held real jobs in the city, the total population might reach 35. Roshi and the abbess, as well as the cook, each lived in separate quarters. Roshi’s house was the highest in the camp, towering over the other living quarters and Zendo. He was revered in awe by almost everyone and could be seen as a lonely figure walking above the camp when most were asleep or eating. I wondered what his enlightened state must be like. I had practiced meditation continuously since 1968, often sitting alone ten or more hours a day while living in Cleveland and Rochester. But the mountain center exposed me to a practice far more rigorous than Kapleau's Rochester Zendo, even if less strictly dedicated to meditation. I left the Thunder Mountain center in 1971, largely because of the extreme severity of the practice there, and what I felt was a lack of emotional warmth both in the students and the monks. We'd be in bed by 9:00 p.m., but be up at 3:00 a.m. for morning practice in an unheated Zendo where the temperature often hovered at zero or slightly below. Our sleeping quarters were unheated from the time we went to bed until 5 minutes before we got up. For 15 minutes in the evening and in the morning, the heat would be turned on by one of the monks. In the morning, we would march from the living quarters to a washroom with 8 or so sinks where we would wash our faces and brush our teeth in frigid water. We would then march up to the Zendo for a brief opening ceremony, a brief tea, and a brief meditation, before being marched down to the Dharma Hall where we chanted the Heart Sutra and other sutras, as well as the four vows in Japanese (Roshi refused to learn English, so we had to learn Japanese). Mind you, this walk was done way before dawn, and if there was no moon, it was pitch black, with steep slopes to our left. After returning to the Zendo, meditation would begin in earnest — in intervals of 25 minutes or so throughout the day, broken only by meals or chanting. We had breakfast after the first sitting, which meant we did a lot of walking, as the dining hall was attached to the Dharma Hall. The Jikijitsu, or Zendo monk, would slowly pace down the long line of sitting lay students and monks, lightly holding his long, sword-like striking paddle over his shoulder, looking for signs of inattentiveness or movement in the frozen meditators. When some hapless student's sitting had grown lax, he'd pause before him, bow reverentially, then hit them two heavy blows on each shoulder. At first no one hit me because my sitting was strong, and some-times I’d give the stick carrier a glare while shaking my head. After having been hit several times by a student who thought he was John Wayne, I fashioned a set of shoulder pads made out of an old sweatshirt. These were hidden under the five layers of shirts and robes I wore during the sub-zero sittings—a trick I learned from another student. At least at Mt. Baldy, when you were hit, it was with the flat part of the stick. During similar sesshin at Rochester, being beaten hard was a sign of honor, with many students requesting it. Near the end of an intense sesshin, the edge of the stick would sometimes be used, often causing severe welts and bleeding shoulders. It was quite a sight to see a cloud of frozen breath extending three feet in front of my face while sitting immobile, with a Japanese monk prowling, stick in hand, ready to beat me if I twitched. I couldn't believe what I had gotten myself into. After the morning sittings we'd march a quarter mile to the dining hall, in absolute darkness along a narrow mountain path, hoping Ryoshu, the Zendo monk, would not lead us over the side of a cliff. On these especially dark mornings, he'd carry a small flashlight to see his way. Worse than the formal, freezing sittings were the blizzards that winter. The snow fell heavy and often. By morning there would be a fresh foot of snow making walking difficult, especially in the dark. The monks would come to the men's cabin at 2:30 to awaken a work crew to shovel snow off the Zendo path and Roshi's walkways. After one sub-zero shoveling session, I found a way out. On the nights it snowed, I got up at 2:00 A.M., dressed, and went to the Zendo to meditate alone. The monks never disturbed my meditation. They thought I was very inspired and didn't want to break my intense practice. I never shoveled snow again in the morning. No matter how early I arose to go to the Zendo, or how late I went to bed, I would see Roshi's light on in his study. He never seemed to sleep. 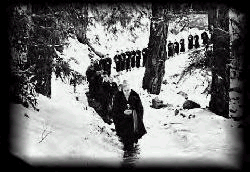 Worse than the coldness of the mountain was the coldness of the monks and the rigid severity of the practice itself. At least the Dining Hall was heated to the extent I did not see my breath. We ate meals in absolute silence in a rapid, ritualistic style. We had 15 minutes to eat our meals during three ritualized servings. The server would stop in front of each setting place, bow and serve until we signaled we had enough. The third serving was so fast no one dared to take more, because we had 5 minutes to make an offering to the hungry ghost of departed souls who roamed the nether worlds. After that, we had just a few more minutes to clean and wrap our bowls. We chanted before the first serving, during the first serving, and after the last serving. I should mention that every activity — from being called to the Zendo, or going to the Dining Hall, or to the Dharma Hall for chanting, to meditate, or to go to an interview with Roshi where we would show our koan understanding — were all signaled by bells or a wood hammer hitting a wood block. Thus, there was no need to talk, and silence was rigidly enforced during sesshin. After eating, my favorite activity was chanting, which we did twice a day, once after the first morning meditation and before breakfast, and then once in the early afternoon. This too, was in an unheated Dharma Hall. 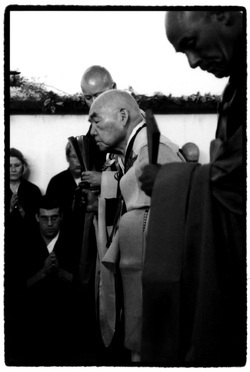 During sesshin — after we all had built tremendous meditation power — I began to hear the most unusual thing after about five minutes of chanting; something similar to Buddhist chanting (which is a low-pitched monotone, with each syllable pronounced separately) but pitched three or four octaves higher, even higher than the highest range of Soprano. It sounded like a choir of angels and was quite awesome and definitely felt ‘spiritual’, whatever that meant. Others heard it too but did not seem concerned as to the origin. My guess was that it was a harmonic formed as a result of almost perfect precision and coordination of our chanting voices. After each chanting, Roshi would come to the Dharma Hall to give a formal talk based on reading a Koan from the Mumukan. Roshi's talks were inevitably funny, yet profound. Usually he would aim a few sarcastic comments at one or another of the students or monks. He also told of his own past experiences in Zen and with early students at this center. He said he used to strike students in Sanzen (the private meetings with Roshi) but, he held up his fist and said, “American students hit back and they had fists four times the size of mine!" He would also talk about the essence of his teaching, which was to find our true center of gravity, the centerless circle with no object or discrimination. The 4:00 a.m. walk to the Dharmna hall was always cold. Since everything at the center was done at the maximum speed, except for meditation, sometimes we'd be in a hurry, putting on our thong sandals sloppily, and they would fall off half way there. It was frowned upon, bad form, to stop and put them on again. You had to stoop, on the move, scoop them up and carry them with you the last two hundred yards or so in bare feet on the ice and frozen earth. As meditation practices got more and more intense, one's ability to tolerate cold increased, day by day. You could see each person stiffening, standing taller, standing and striding stronger. They wore fewer and thinner clothes because they felt the cold less. I watched the odd phenomena that after the fourth or fifth day of sesshin, people began not to wear their sandals in the bitter cold and 6 inches of new snow. It was no longer necessary, no one felt the cold anymore. The students just focused on their koan, and built great energy. The most important time each day, and often the most terrifying, was Sanzen, where we would each met Roshi alone in his house to answer questions about the koan he had given us. During the regular training periods, we'd see him twice a day which would increase to five times a day during the Rohatsu Sesshin, the strongest of the year. After a period of sitting meditation we'd go one by one to the Sanzen hut sitting face-to-face on parallel benches across the room. In single file, we would wait to hear Roshi’s bell, which was a signal that the previous student was done. We would then ring a larger Sanzen bell twice, announcing we were ready to meet Roshi, then walk to his front door. A lot could be learned from the sound that the student made when ringing the bell. If the student’s meditation was strong, his bell-sound would be crisp, strong and completely balanced. If the student’s meditation were weak, his bell ringing would be similarly sloppy, badly timed and off-tone. We would then walk up the path to his house, leave our sandals just outside the door, and enter a small anteroom next to Roshi's Sanzen room, where he also slept in the evening. Meeting Roshi required a ritual full prostration bow at the door, then take three steps towards him and make two more full prostrations, then to sit on a cushion three feet in front of him. Roshi was a very small man, at most five feet tall, with a very large head and a bull neck. Yet, in Sanzen he always seemed to be half a head taller than I. I could never understand how someone so small standing up, could be so tall sitting down. I thought it might be my awe, which made him seem larger. The winds at Mt. Baldy blew constantly, with roaring and whistling through the trees and eaves of the Zendo. The windows were made of paper. There was always the smell of incense. The Zendo was dark in the morning and evening. We all sat perfectly, and at some point, almost every time I sat, I disappeared. There was no more me. My body and mind disappeared and I became the world, the breathing of the wind, the sound of an airplane overhead. I became one with the totality of objects in my consciousness, which was oneness. In the rich, cold environment of a cold, snowy mountain, I became one with everything including the wind and the trees. This experience happened time, after time, after time, and from this state, the answers to koans flowed. The first koan he gave every new student was, "How do you realize God when looking at a fir tree?" The first time in Sanzen, I argued with him that I didn't believe in God, but he repeated the question anyway. The second Sanzen I told him once again I didn't believe in God, so he changed the koan to "How do you realize your True Self when looking at a fir tree." This satisfied my need to make a statement about who I was and what my position was, freeing me to work on the koan. One wrong answer that got a laugh from him, and everyone else when we heard of it, was when a frustrated student took a large fir tree branch, hid it under his Hakima (robe), and whipped it out and presented it to Roshi in Sanzen. Actually, the 'right' answer came rather quickly after failing with the usual verbal answers because of previous experiences of merger with trees while at Baldy. I will not reveal the answer as Roshi, I believe, may still be using that koan. However, when a student gave an answer that was close, Roshi might say, "You got maybe 60%. Go back and do more Zazen." To another friend, he said, "Your tree is sick — more Zazen." I got a 70% on this first attempt. On the second attempt, he passed me, beginning a series of checking koans to test my understanding. Koans have various ranks or degrees of difficulty and which check different kinds of enlightenment experiences. This koan is of the first rank, testing the student's ability to lose identification with the body and self to become one with the world. I and the world were not two. Another koan at this same level is "How do you stop the wind?" A correct answer would be to physically demonstrate you were the wind by making wind sounds with your mouth and then dancing around the room like a leaf caught in a gale. Both together indicate that one has both experienced unity with the wind in meditation and also could demonstrate this silent, non-verbal identification without using the discursive mind. As Roshi would say, "You must manifest yourself!" On a good day, during a Sesshin when my meditations went well, I might answer two new koans a day, while other times between sesshins, I might be stuck on one for three or four days. Sanzen was also an occasion to raise other issues or concerns. One of mine was the increasing loneliness I felt being so far from my home, friends and normal life of work and career. In one Sanzen meeting, he said "There is no love in Zen!" in response to my query about feeling my need to be in a relationship and the lack of connectedness I felt at his center. However, I knew about Roshi's personal life in this area and took his answer with a grain of salt. He was a notorious flirt and there were constant rumors about his relations with female students and the abbess of Mt. Baldy, Giesela Chaney, a strikingly pretty woman for whom I felt an immediate crush. He obviously was using a didactic device to get me out of my loneliness and more into my practice. Yet what he said made me realize that I did want to be in an environment more encouraging and supportive. The most warmth I felt during my entire stay, was a sad tenderness towards a lone coyote that sometimes followed behind us in the pre-dawn morning as we walked barefoot around the Zendo between sitting sessions. He looked as lonely and cold as I felt. I longed to be in Los Angeles where people actually smiled and the climate was 40 degrees warmer. We never smiled at the center until a training session was over. Ascetic heroism had had its place in my earlier practice, but not now, not at this time. I felt my sadness and loneliness increase along with self-directed anger for placing myself in this harsh environment. I began feeling a deep rage towards several of the monks, resulting once in a judo bout on the Zendo floor with Ryoshu, the Japanese monk in charge of Zendo discipline, and a black belt in Judo — a profoundly satisfying experience, since I felt I came out of the scuffle the victor despite his reputation for toughness. Outweighing him by thirty pounds helped. Ryoshu liked me after that incident, often pointing me out to others as being "very strong," meaning more that I was aggressive rather than just having physical strength. It was not all pain at Mt. Baldy. There was a lot of concentration camp humor. One friend left two months before I did, saying it would be such a relief to be able to look at a tree without becoming it, referring to the merger type answers we had to give to these first rank koans. A journalist who had come to write an article about Zen, left after three weeks on the mountain. In Zen, nothing is ever wasted; everyone becomes a pack rat. Dish water and water used to wash floors was to be disposed of by watering bushes or trees. The monks told us this was the way of Zen. One evening it had rained two or three inches and then snowed two to three feet of snow. The next morning Mt. Baldy was a frozen lake covered by snow. When the journalist had cleaned the Zendo floor, a monk told him to throw the water out on a tree's roots. He began to laugh uncontrollably. He laughed most of that day, and the next day and the next. He couldn't believe anyone could tell him to water a tree when we had already had six inches of rain and perhaps four feet of snow that month alone, and the whole world was frozen in ice. He laughed for three days and left. One time I saw Roshi outside his house, throwing a wash basin of water onto the rocks next to his porch. He saw that I saw him. Five minutes later he came out again. This time he walked over to a tree and poured the water on its roots, glancing at me to see if I saw him. But gallows humor prevailed, the mental pain and physical discomfort were great. Another time after a severe rainstorm had made many roofs leak, I was ordered to repair Roshi's roof with a new layer of tile. I was working with a new student, both of us perched precariously on the roof top. Ken innocently asked, "Is this what Maslow means by a peak experience?" During the later Sesshins of the Winter, he had the monks bear down in terms of increased pressure and an almost tangible brutality in the use of the stick and Ryoshu's throwing students off the two foot high bench called a 'Tan,' onto the Zendo floor, shouting at them to run to Sanzen with Roshi. Weeks before I left, I met Ram Dass, who came to the center for the toughest seven-day retreat of the year — the December Rohatsu Sesshin. Afterwards he told me he had many of the same feelings and reactions, sometimes just disappearing for two or three hours at a time, refusing to return to the unheated meditation hall with its fierce and painful discipline after a Sanzen meeting with Roshi. Leonard Cohen, the composer and singer, was there too that winter. Unlike Ram Dass and myself, he loved the practices, the cold and isolation, especially finding relief from relationship problems at that time. He told me that Baldy gave him a welcome rest from women. One time the Shoji (in charge of students) put me at the head of a work detail of raking the mountain paths clean of rocks and leaves with both Ram Dass and Cohen as assistants. I felt rather intimidated and awkward in telling either of them what to do. Ram Dass left immediately after Rohatsu, but Leonard stayed the entire winter. I gleefully watched the competition for attention between Roshi and Leonard after Sesshin, and we had a Christmas party. Leonard would be singing one of his compositions, raptly engaging the thirty students remaining at the center, while Roshi made disparaging remarks from the background. Leonard would pause a second, wondering what was happening, then go on, warily watching Roshi from the corner of his eye. My feeling was that Sasaki felt this was his concentration camp and he didn’t want a mere prisoner upstaging him. This was a great way to learn authentic, cultural Zen but I also wanted to live long enough to enjoy it. By February the cold had penetrated to my bones and nothing seemed to warm me up. Once a month we'd leave the mountain to go to the hot baths in Desert Hot Springs or to Palm Springs for a day. I never enjoyed anything as much as leaving that mountain. When I was at Mt. Baldy, to get us to listen closely during Teisho (as if we had any choice, we were snowbound in -7 degree temperatures, no television, radio or talking), Roshi would say, "Listen closely, I am 65 years old and I will die soon." Well, so far he is still teaching, even though over 100, and has not outlived his usefulness. Biography: Joshu Roshi was born in April 1907 in Miyagi, Japan. He came from a farming family. At the age of 14, he became a novice Zen monk at Zuiryo-ji under abbot Joten Soko Miura Roshi. He trained under Joten Roshi for seven years and became a Zen priest at the young age of 21. He was given the name Kyozan. When Joten Roshi left to be head abbot at Myoshin-ji, Joshu Roshi followed him there. He decided to leave there after two years and transfer to Zuigan-ji monastery. He trained there for roughly ten years before finally becoming a Roshi in 1947. He became abbot of Yotoku-in, but he would soon leave there in 1953 to be abbot at Shoju-an. Shoju-an is a remote temple in the Japanese Alps that Joshu Roshi fully restored. In 1962, he was invited to come to America. On July 21, 1962, he arrived in Los Angeles. He was the sponsor of Dr. Robert Harmon. His reputation quickly grew and by 1968, their organization was able to buy their first bit of property, the Cimarron Zen Center. Three years later, they opened the Mt. Baldy Zen Center, which would become their main training center. Since this time, over 30 Zen centers have been opened in North America and Europe. A special celebration was held in April of 2007 to celebrate Joshu Roshi's 100th birthday.